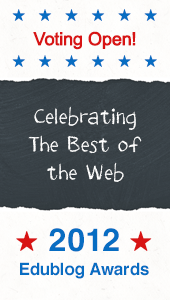 Edublog Awards – Vote for Us! We are excited to announce that we have been shortlisted as finalists for a number of Edublog Awards. You can see all the finalists on this Google Doc. Voting is now open for the worldwide 2012 awards. Mrs Morris, Miss Jordan, 4KM and 4KJ need your support to help Leopold shine! Voting closes on Monday 10th December at 4pm and the Awards Ceremony will be held online at 11am on Thursday 13th December (Victorian time). Voting is now open for the worldwide 2011 Edublog Awards. Mrs Morris, Miss Jordan, 2KM and 2KJ need your support to help Leopold shine! Voting closes on Wednesday 14th December and the Awards Ceremony will be held at 11am on Thursday 15th December. You will simply need to use the drop down menu to pick your category and your choice. Then press vote. You have one week to vote. Please vote daily! Only one vote per category per day will be counted per IP address/location. The system will accept your vote more than once, but only one vote will be counted per day. You can vote in as many categories as you want per day. You can vote for yourself. These are our suggestions to support our students and teachers. Many of our blogging buddies are also nominated so perhaps you could vote for them too! Want a flyer to email to friends or print off for your workplace? Please email, text and phone your friends now and ask them to vote for us every day until next Monday! Vote today and have your say! Leave a comment and tell us who you voted for. This entry was posted in Special Events and tagged Edublog Awards, Edublogs, vote by Kathleen Morris. Bookmark the permalink. Wow! The Edublog Awards voting is going to be very interesting! I can’t wait to see the winners! Who did you vote for?? Thank you for voting me as best student blog! I hope I get shortlisted. It is my pleasure for voting you! You have a very good blog! I can’t wait for the Edublog Awards! I have just just voted and I voted for all the blogs you said to. For the best student blog I voted for Skye’s Super Blog because she always has great posts on, they never have any mistakes and she does posts reguly. I hope the 4KM and 4KJ blog gets in the top 5 like the 2KM and 2KJ blog did. Thank you for leaving a comment on the blog! I also voted for the ones that Mrs Morris told us to. I voted for my student blog, but if I couldn’t I would’ve voted for Bronte’s Barn. I am a big fan of this class blog and Kathleen Morris’ blog! I voted this class blog as best class blog and Mrs Morris’ blog as best teacher blog. Good luck, my fingers are crossed for you! Hi I am Trent from 4KM. I am honed to have you as an admirer to our blog. Thanks for nominating us for best class blog. I hope we win the edublog awards this year. My fingers are also crossed. You are very welcome!4KM and 4KJ and your teachers definitely deserve it. Georgia is very excited to be a finalist in the best student blog. I am excited too for her as she has been putting alot of time in to with blogging this year. She enjoys blogging daily. I look forward to hearing what the results are next week. Georgia must be excited about being shortlisted! I know I would! I also can’t wait for the results! It is very exciting to be shortlisted for the Edublog Awards, well done to everyone who has a blog and blogs regularly, good luck to everyone involved. I have voted every day this week and fingers crossed, this year brings home a win! My name is Maha. I am from 4KM. It is very exciting to get shortlisted! It must be a honour for anyone who got shortlisted! We are all thinking of ideas for everyone to vote! I can’t wait to see who wins! I think that is a wonderful achievement to be shortlisted for the Edublog awards. As it’s held worldwide, there would be many out there trying. For Best Class Blog, I voted of course, the 4KM and 4KJ blog. I have voted every day so far, from my Nan’s computer and my computer. For Best Student Blog, I chose Skye’s blog. All the Student blogs are great, but Skye’s especially stands out to me. Skye thoroughly deserves this award as all her blog posts are very quality. I have also voted Skye’s blog every day so far. I hope 4KM and 4KJ can accomplish another achievement of landing in the Top 5 for Best Class Blog! in the Edu Blogs Awards. Thankyou for your comment! Also thankyou for congratulating us on our achievement!